A series of paired lines passes through areas of white, grey, and black. The lines remain the same throughout. They have a consistent wavy (sinusoidal) shape. The difference between the sets is the placement of light and dark segments: one set has the tone change at the bottom of the curve. As the sets of lines pass through the grey area, some of them seem to take on an angular, zig-zag quality. The effect is extremely compelling. "The underlying mechanisms for the gentle curve perception and those of obtuse corner perception are competing with each other in an imbalanced way and the percepts of corner might be dominant in the visual system." For a high level discussion, read the comments after the Discover Magazine blog post. Read Mr. Takahashi's scientific paper. Thanks to several of you who let me know about this. I wonder if this is related to the painting technique of representing a curved shape by using a series of straights? Loomis called this the "blocky treatment" and Schmid suggests it too. I always thought this was a simplification that resulted in a stronger visual statement that created the "appeal" but maybe its simply more appealing because we are wired to perceive straights? but WHY only in the grey area is the effect so strong? 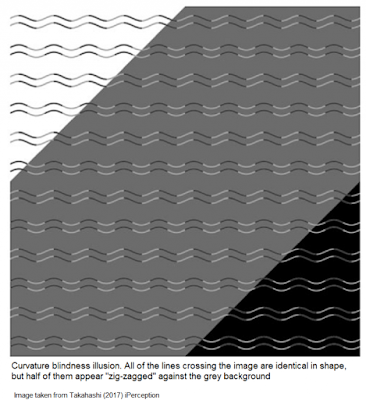 Is this area really making the lines that much more ambiguous for our brain? Why is it only effective (SO effective!) in the grey?! Robb, my theory of why the illusion shows up in the grey area is because the background tone is halfway between the lighter and darker tones. Thus, they read in terms of a light edge and the dark edge of a 3D angle shape. When the tones change at the other places on the curve, it doesn't suggest a possible lighting arrangement, so that form-seeking part of the brain isn't called into play. Daroo, that's an interesting connection. Maybe straights impress us more forcefully because they are wired more closely to the root of our perceptual system. But there are compositional theories such as Ruskin who seem to think that curves are the essential building block of nature and perception. Cool find! I love optical illusions like this. Your blog is always full of neat stuff like this James, love it here.